1. Institutional Property Advisors (IPA), a division of Marcus & Millichap announced the $52M sale of Alta Midtown, a 225-unit apartment complex in Midtown Phoenix. Steve Gebing and Cliff David of IPA represented the seller, Wood Partners, and procured the buyer, FSC Realty. 2. Maravilla Apartments, a 225-unit multifamily community at 13621 W. Glendale Ave., Glendale sold this month for $37M. The NorthMarq Multifamily team of Trevor Koskovich, Jesse Hudson, and Bill Hahn represented both the seller, Renue Desert Gardens II, LLC, an entity formed by Renue Properties and the buyer, Keller Investment Properties, LLC. 3. Studio 710, a 239-unit apartment community at 710 Hardy Dr., Tempe, has been sold to Tara Investment Group for $26.75M. Tara Investment Group was self-represented while Brad Cooke and Cindy Cooke of Colliers International in Arizona represented the seller, Domain Communities. 4. ABI Multifamily has announced the $21.8M sale of Mission Antigua Apartments, a 248-unit garden-style apartment community at 5525 South Mission Rd, Tucson. The buyer, Element Property Company, and seller, the original Arizona-based developer, were both represented by the multifamily brokerage team of Alon Shnitzer, Ryan Kippes, John Kobierowski, Rue Bax, Eddie Chang and Doug Lazovick. 5. Blandford Homes successfully outbid Tolls Brothers for 132 acres of Mesa land at the NWC of Recker and Thomas Roads for $21.1M. 6. Puesta Del Sol, a 128-unit apartment complex at 8818 S. Central Ave, Phoenix, has sold for $8.725M. The buyer was Urban Communities and the seller was Familia de Tres, LLC. Kidder Mathews’ multifamily investment broker, Karl Abert, represented both parties. 7. Marcus & Millichap has announced the $6.5M sale of Arbor Villas, a 114-unit apartment property at 1625 E Prince Rd, Tucson. Hamid Panahi and James K. Crawley, investment specialists in Marcus & Millichap’s Tucson office, represented the seller, a limited liability company. The buyer, a limited liability company, was secured and represented by Hamid Panahi and James K. Crawley. 8. SVN | Desert Commercial Advisors has announced the $2.4M sale of the Shops at Sierra Vista, 439/465 N Hwy 90 BYP, Sierra Vista. SVN’s Rommie Mojahed and Beau Flahart represented the seller, Roth Partnership, LLC. The buyer was INU Real Estate Management LLC. 9. The Phoenix office of JLL has completed a lease at 101 North that will establish the first downtown Phoenix location for WeWork. WeWork will lease four full floors, with the option to take additional floors, at 101 North, a Class A office tower owned and managed by ScanlanKemperBard (SKB). JLL Executive Vice President Ryan Bartos, Managing Director Andrew Medley and Associate Kyle Seeger represented WeWork in the lease negotiations. JLL Managing Director John Bonnell, Executive Vice President Brett Abramson and Senior Vice President Chris Latvaaho represented SKB as the exclusive leasing brokers for 101 North. 10. Legacy Traditional School – Goodyear will open its doors at a vacant 37KSF located at 16060 W. Lower Buckeye Pkwy, west of the Phoenix Goodyear Airport. The new school will serve students in grades K-6 and will have an enrollment capacity of 700 students. 11. NAI Horizon’s Jeff Adams represented the tenant, Big City Insulation, Inc., in a 36-month industrial lease for 19.8KSF at 2316-2328 W. Huntington Dr, Tempe. Matt McDougall & Chris McClurg with Lee & Associates represented the landlord, Highland Associates, LLC. 12. 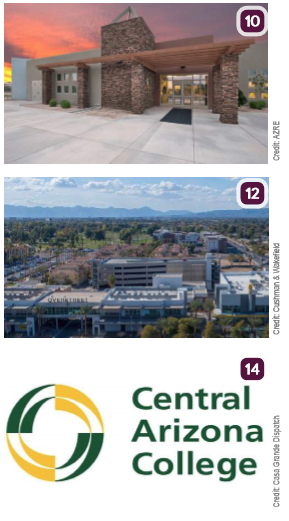 On behalf of DT Chandler LLC, Cushman & Wakefield announced that Revint Solutions signed an 18.5KSF lease at Overstreet, 101 N. Arizona Ave, Chandler. Scott Boardman and Dave Carder of Cushman & Wakefield’s Agency Leasing team represented the landlord in the acquisition. Tanner Milne of The Menlo Group represented the tenant. 13. Chris Gerow, Shelby Tworek, Gabe Ortega and Patrick Anthon with NAI Horizon represented the tenant, Peddlers Mall, LLC, in a 63-month retail lease for 14KSF at 185 W. Apache Trail, Apache Junction, AZ. Brian Gausden with Western Retail Advisors represented the landlord, SimonCRE Lodgepole, LLC. 14. Lucid Motors plans to use the Central Arizona College center in Casa Grande for temporary office space while it builds its manufacturing plant nearby. The CAC Governing Board gave approval to lease a portion of a college-owned building to the city of Casa Grande, which will in turn lease that space to Lucid Motors for temporary office space.